Noize Konspiracy was founded in 2005 as a split-cd collaboration of GULE TVOJHO FOTRA (uchylord), ŽEBROTA (gorioth) and 0N0 (twisted). The releasing of CDs became a tradition, with new compilations coming out 2 or 3 times a year, motivated by hedonic listening parties following the release. Each member delivers cca 10 minutes of new material on every compilation. The first NK was almost pure noise / ambient noise with sounds evolving more and more towards music with each release. Genres now include noise rock, noise pop, electronic, ambient, industrial, psychedelia, on the latest NK even pure grind core EP is present. One of the founding members – gorioth – is known for his undying faithfulness to harsh noise. 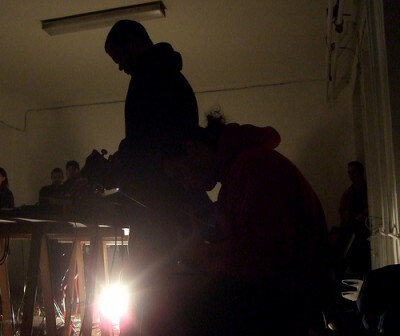 Attempts at live shows were made, with mixed results – mainly because the strictly improvisational and nihilistic approach. This uncompromising mess is captured at the special live release of NK – Live @ Garage. At the present time, four members of NK have been rehearsing and are ready to play live. Their first official performance, which took place in 13m3 gallery, was recorded and is available for download in the Music section.